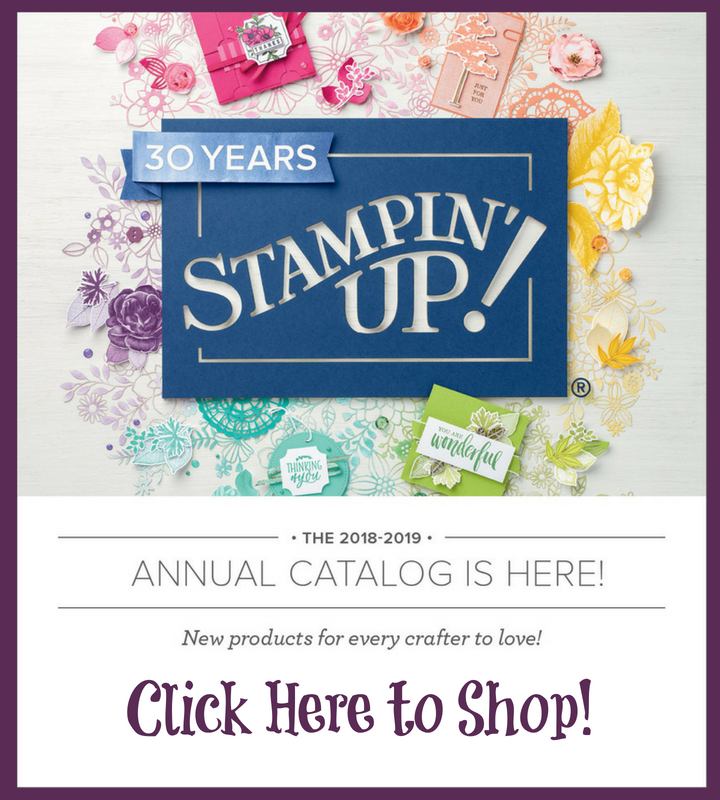 Welcome to my stop on the 2016 Stampin' Addicts New Catalog Blog Hop featuring stamp sets that are BRAND NEW from Stampin' Up! 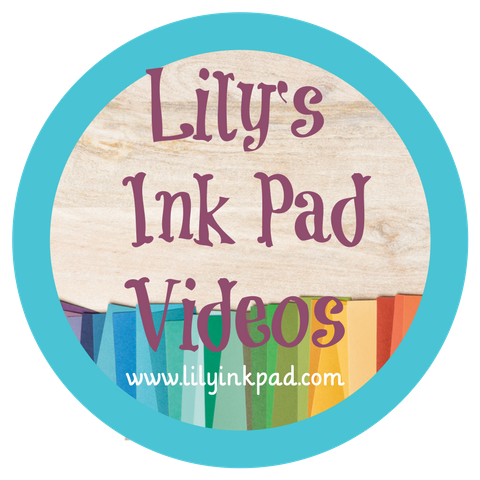 A Blog Hop works like this: You can start here and click NEXT from blog to blog to see each Demonstrator's creations or you can click PREVIOUS and go backwards through the circle. Either way, you'll see some amazing products and projects. 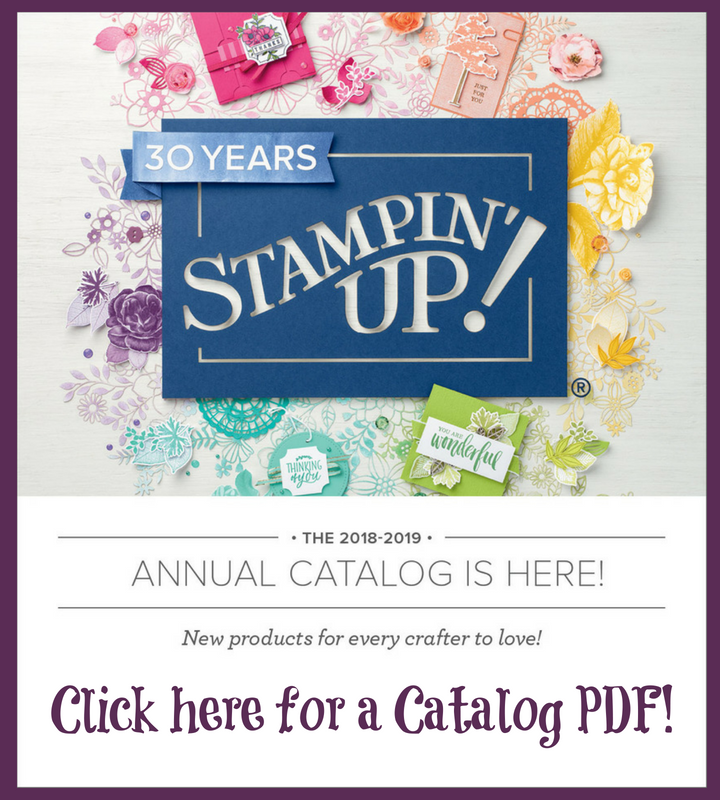 You can also discuss what you love on the Stampin' Addicts Forum Website. I chose the set Always an Adventure because I love making masculine cards and I love bold images. This set has it all and works well for a variety of projects that are pure fun. See-- all fun. I love making fun fold cards, so my very first project was the diorama card on the left. My stamping celebration stampers were amazed at how easy it was to assemble. I will have a tutorial on Monday to show you how I created it. There are actually three levels--the Dapper Denim, the Pool Party/Mountains, and the Emerald Envy trees/pond layer. The card folds flat and when opened, the layers pop apart. You can write on the back any sentiment you want. I used the new Banners for You bundle for the "You Amaze Me" sentiment. See, it's layers are more visible from the top or in real life. 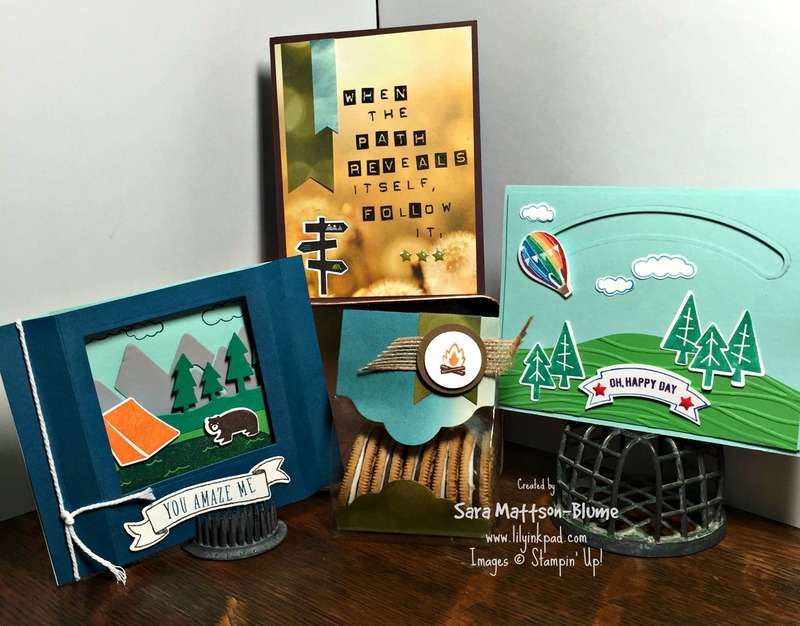 The card furthest right is a spinner card using the new Sliding Stars Framelit Dies, but the stamped images are from the Adventure Awaits Stamp Set. For this card, the sentiment is from the Thoughtful Banners Stamp Set and Duet Banner Punch. The "grass" is Cucumber Crush trimmed by hand and then embossed with the Seaside Textured Embossing Folder. The signpost stamp caught my attention and I knew I needed to make a card that talked about choosing one's path in life. However, we didn't have a stamp that had that sentiment, so I used the Labeler Alphabet Photopolymer Stamp Set. It was pretty cool, as I just placed all the letters I could word by word on one clear block and stamped. There are multiples of frequently used letters, so this made the whole process easy. I added more letters and stamped again. Because they are photopolymer, I could be careful about adding in a letter here or there. I also didn't need them to be perfectly lined up to fit the style of my card. 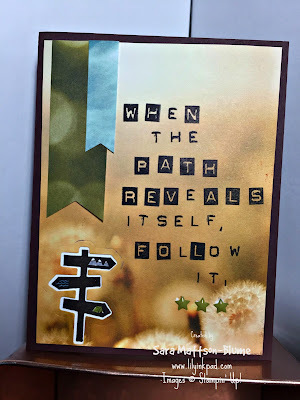 I used the Outdoor Adventures Framelit Dies to cut out the signpost from the Serene Scenery Designer Series Paper. I stamped the sign post in Early Espresso and colored the tent, water, and mountains with Many Marvelous Markers. I added some banners and can you see the new Enamel Dots that include shapes? My Niece thought that the stars needed to be there. 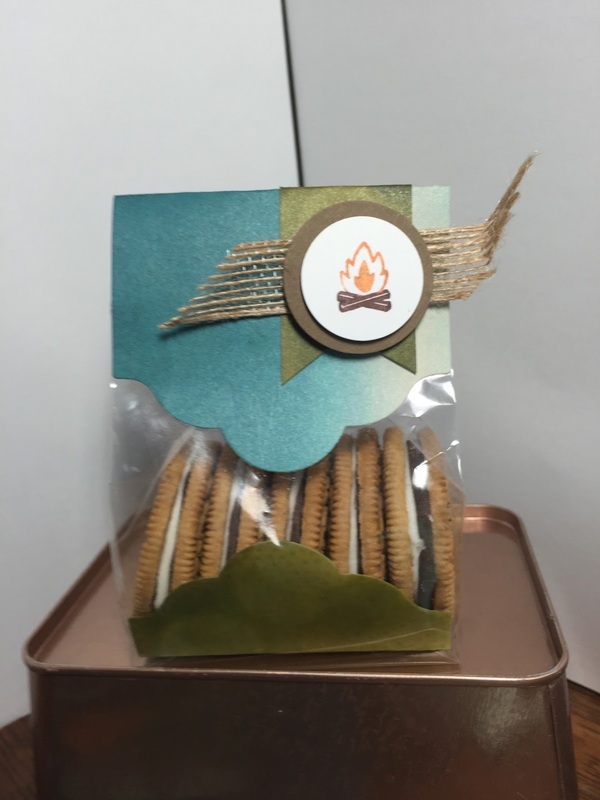 On my way to a cabin for the weekend, I found Oreo Brand S'more Cookies and they are yummy. I decided that they would be perfect for this project and saved 5 for this photo. When members of my family discover them, they will disappear. 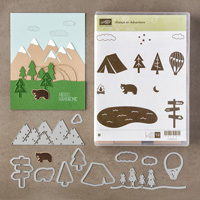 For this project, I cut out two of the largest shapes from the Lots of Labels Framelit Dies out of the Serene Scenery Designer Series Paper. I stamped the Campfire image by coloring with markers directly on the stamp. My trusty circle punches helped me layer and I added a piece of the 5/8" Burlap Ribbon cut on an angle. The new Gusseted Cello Bags worked perfectly for this project as I added the second label to the bottom for color. I hope you liked my projects. Come back on Monday for more details and pictures. Until then, click PREVIOUS to go backwards to see Rhonda's Shooting Star Bundle projects. Or you can go forward in the loop by clicking NEXT and heading to Tanya's Birthday Fiesta Projects. These are amazing, Sara!!! You really knocked this one out of the park! Love the diorama card, and the signpost card is stunning. That hot air balloon card is adorable too! Thanks for making the banner as well. So super cute, Sara! I love your diorama, but they are all wonderful! Fabulous projects!! Ok you convinced me... I need to order this set now. These are all SO cute! !